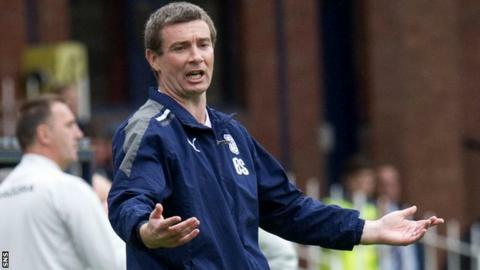 Dundee manager Barry Smith described the 2-1 defeat by Motherwell as "a harsh lesson". Smith's side led through Colin Nish's goal before a Michael Higdon double clinched three points for the league leaders. "We can't forget that Motherwell are top of the league and are a quality team," Smith told BBC Sportsound. "We controlled the game in the first half but lapses in concentration cost us." Nish's header saw Dundee capitalise on an impressive first half display but the Steelmen responded to preserve their place at the top of the table. "It was a great build up," Smith said of Higdon's goal. "It was a good ball in from John Baird and a great finish from big Nishy. I'm delighted he got on the scoresheet. "We didn't feel under too much threat although Motherwell had a lot of the ball, then we had the lapses in concentration. "But that's why they're top of the league and we're sitting at the bottom. That's the difference in the two teams."